Just Glow! Baked Highlighting Trio in 1334 Rooftop Rendevous & Hard Candy Look Pro Eyeshadow Pro Palette 1339 Rose Gold. The Hard Candy Look Pro Eyeshadow Pro Palette is 0.69 oz / 19.5g of product for $10US and $14.98CAN at Walmart. The Hard Candy Just Glow! 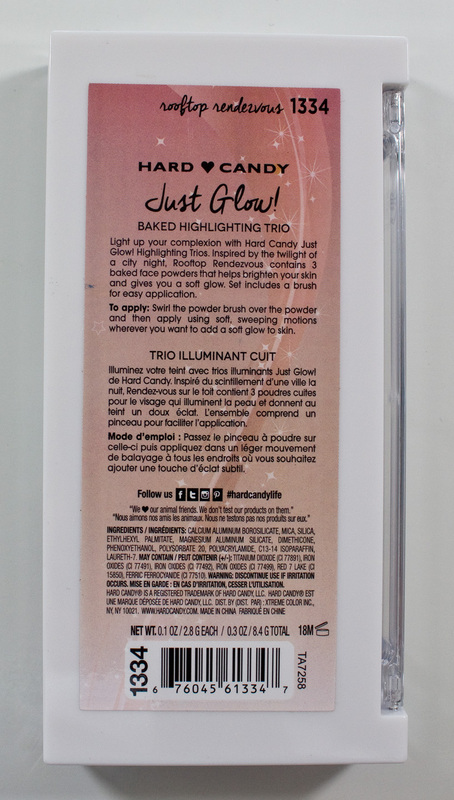 Baked Highlighting Trio is 0.3 oz / 8.75 g of product for $6US and $9.98CAN at Walmart. 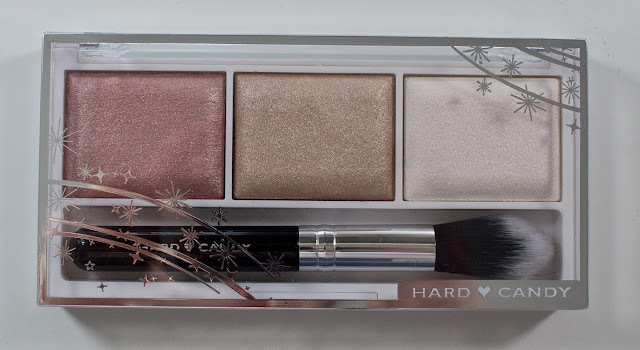 Hard Candy Look Pro Eyeshadow Pro Palette 1339 Rose Gold. Shades in Diamond, Charmer, Sweetheart, Love Affair, Marry Up, Frisky, First Date, Double Date, Heart Breaker, Kiss and Tell, Single, Sweet Nothing, Roses, Ball and Chain, & Heart Beat. Hard Candy Look Pro Eyeshadow Pro Palette 1339 Rose Gold. 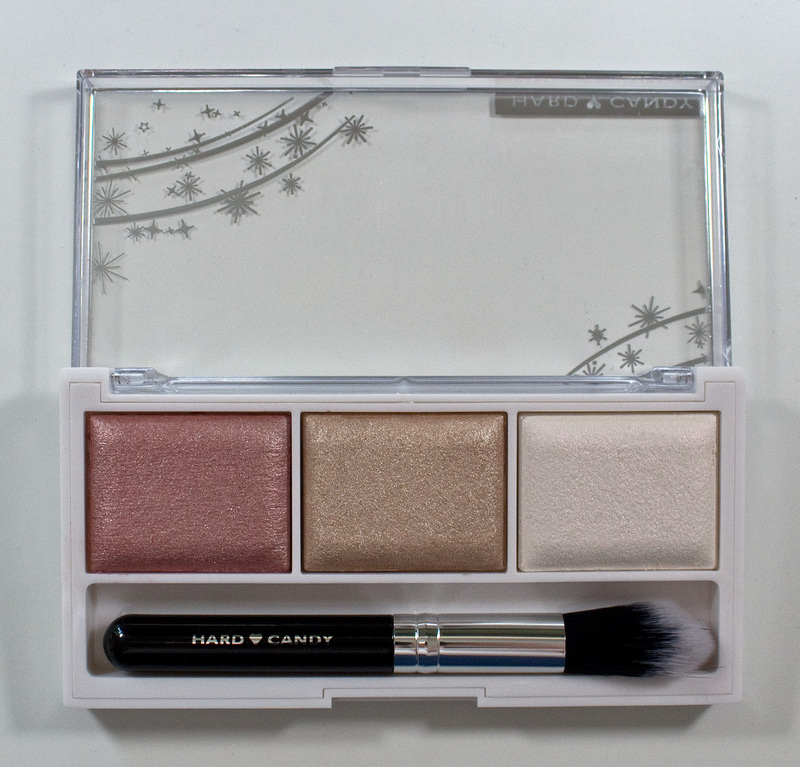 Hard Candy Look Pro Eyeshadow Pro Palette had a bottom opening with Hard Candy embossed into it. 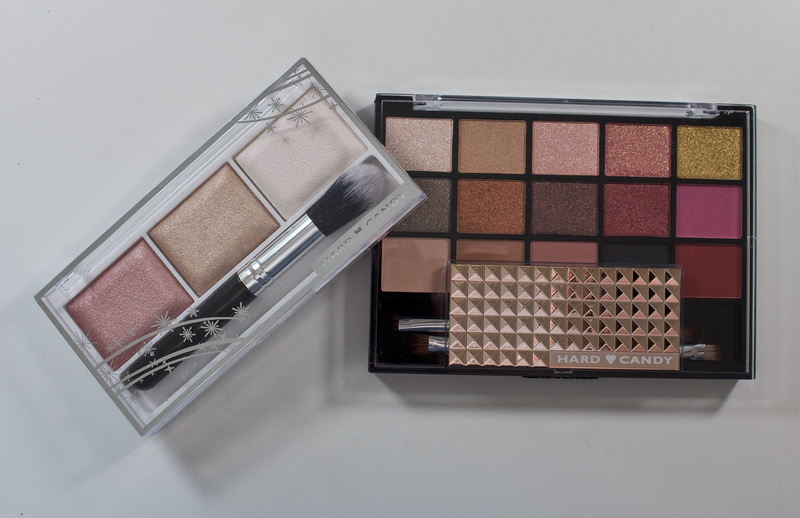 Hard Candy Look Pro Eyeshadow Pro Palette brushes. Just Glow! Baked Highlighting Trio in 1334 Rooftop Rendevous in Shade 1, Shade 2, and Shade 3. Just Glow! Baked Highlighting Trio in 1334 Rooftop Rendevous ingredients. Just Glow! Baked Highlighting Trio due fibre brush. Strobe Highlighter in Holographic Lights: Mica, Dimethicone, Nylon 12, Magnesium Aluminum Silicate, Phenoxyethanol, Methylparaben, Calcium Sodium Borosilicate, Titanium Dioxide (CI 77891). Vivid Baked Highlighters in Radiant Lights: Mica, Dimethicone, Silica, Nylon-12, Magnesium Aluminum Silicate, Methylparaben, Propylparaben, Titanium Dioxide (CI 77891), Iron Oxides (CI 77491, CI 77492, CI 77499). Vivid Baked Highlighters in Peach Lights: Mica, Talc, Dimethicone, Nylon-12, Magnesium Aluminum Silicate, Methylparaben, Propylparaben, Titanium Dioxide (CI 77891), Iron Oxides (CI 77491). Hard Candy Look Pro Eyeshadow Pro Palette eyeshadows are in the formulas of Frost, Shimmer, Satin/Pearl and Matte. The Frost shade are shimmer formula base with high glitter shimmer in them. These shade do have pigment, but you need to pack in this eyeshadow into a primer to keep the frost shimmer on the lids. But the shimmer base lasts on their own. The shimmer shades are great and smooth to apply on bare skin and perform even better over a primer while being very pigmented. The satin/Pearl shades are smooth to apply and pigmented. The matte shades, however, ware pigmented but powdery as a formula. They do blend, but on bare skin, they can blend away on the skin because it lacks a bit of binder in the formula. They are more pigment than shadow and needs a primer to make them last on the lids. But they perform wonderfully over a primer. The Hard Candy Just Glow! Baked Highlighting Trio formula is a shimmer baked formula that leans on the drier side. All the shades are powdery and had very little binder compared to their baked single powders. The shades did work over face products better than on bare skin. Diamond is a pale base champagne with a white frost finish. Charmer is a warm beige with a pearl finish. Sweetheart is a pale pink champagne with a frost finish. Love Affair is a bright pink with a gold frost finish. Marry Up is a gold shimmer with a yellow gold frost finish. Frisky is a cool taupe with a white shimmer finish. First Date is a warm copper with a shimmer finish. Double Date is a warm deep brown with a shimmer finish. Heart Breaker is a red rust with a shimmer finish. Kiss and Tell is a cool bright pink with a matte finish. Single is a pale peach beige with a satin finish. Sweet Nothing is a is a warm brown with a matte finish. Roses is a dusty blush brown with a matte finish. Ball and Chain is a charcoal black with a matte finish. Heart Beat is a warm red with a matte finish. Shade 1 is a deep dusty pink with a gold shimmer finish. Shade 2 is a tan gold with a gold shimmer finish. Shade 3 is a with a pink shimmer finish. Wear: The Look Pro Eyeshadow Pro Palette 1339 Rose Gold the shimmer shades lasted 6 hours on bare skin. The matte shades only lasted 4 hours on bare eyelids. Definitely works better over an eyeshadow primer! The Hard Candy Just Glow! Baked Highlighting Trio wears for 4 to 5 hours on bare skin. They also work better over foundation products. 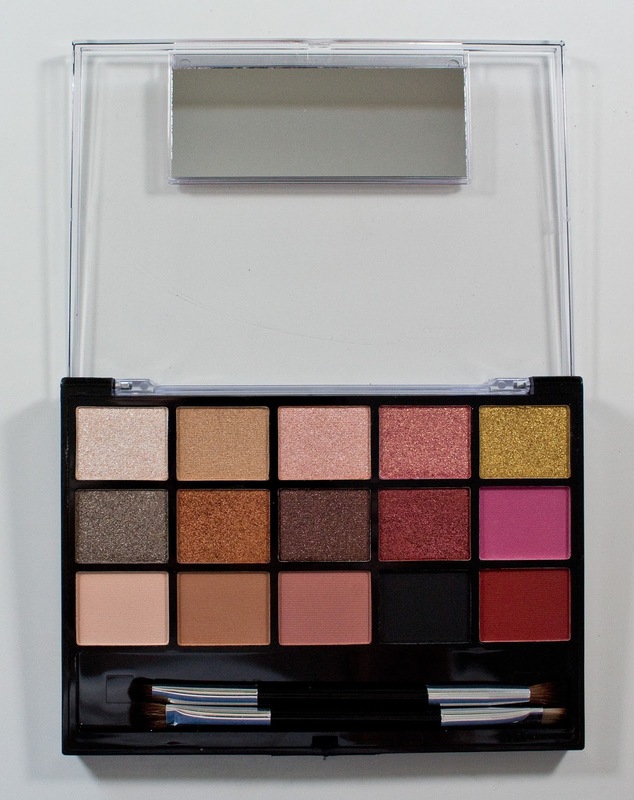 Packaging: The Look Pro Eyeshadow Pro Palette is a black plastic compact with clear lid. The dual-ended synthetic brushes are excellent in this palette. The larger shadow brush is a little loose, but the rest are well formed the right density for the brush style and not scratchy on the lids at all. The Just Glow! Baked Highlighting Trio is a white plastic compact with clear lid. The duo fibre brush is also a great brush to work with on the skin and feel like a better quality pro brush I get at IMATS from Bedeliumt tool, Royal and Langnickle, and Crown. Daylight swatches: Diamond, Charmer, Sweetheart, Love Affair, Marry Up, Frisky, First Date, & Double Date. Flash swatches: Diamond, Charmer, Sweetheart, Love Affair, Marry Up, Frisky, First Date, & Double Date. 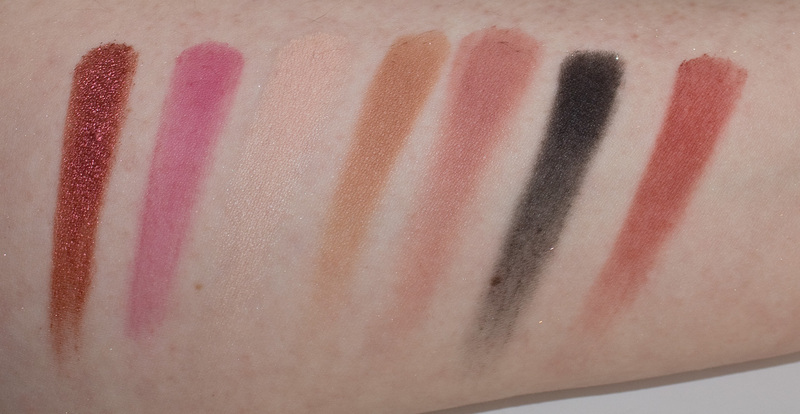 Daylight swatches: Heart Breaker, Kiss and Tell, Single, Sweet Nothing, Roses, Ball and Chain, & Heart Beat. Flash swatches: Heart Breaker, Kiss and Tell, Single, Sweet Nothing, Roses, Ball and Chain, & Heart Beat. Daylight swatches: Shade 1, Shade 2, and Shade 3. 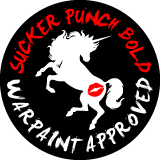 Applied heavy and buffed out. Flash swatches: Shade 1, Shade 2, and Shade 3. Applied heavy and buffed out. 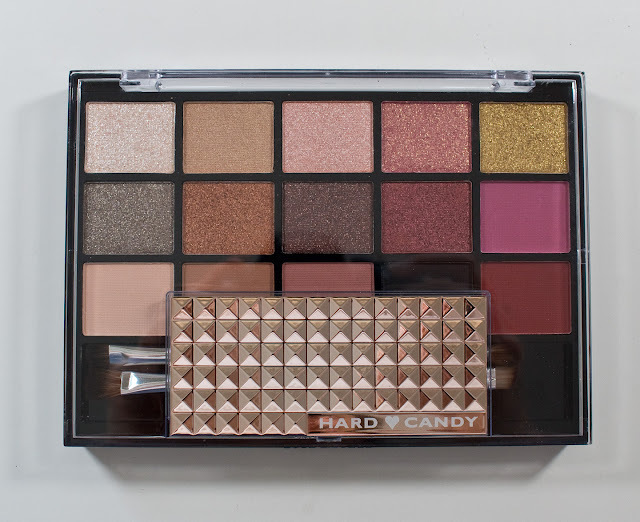 The Hard Candy Look Pro Eyeshadow Pro Palette 1339 Rose Gold it a lovely palette that echoes the Huda Beauty Rose Gold (Remastered) Eyeshadow Palette regarding shades. 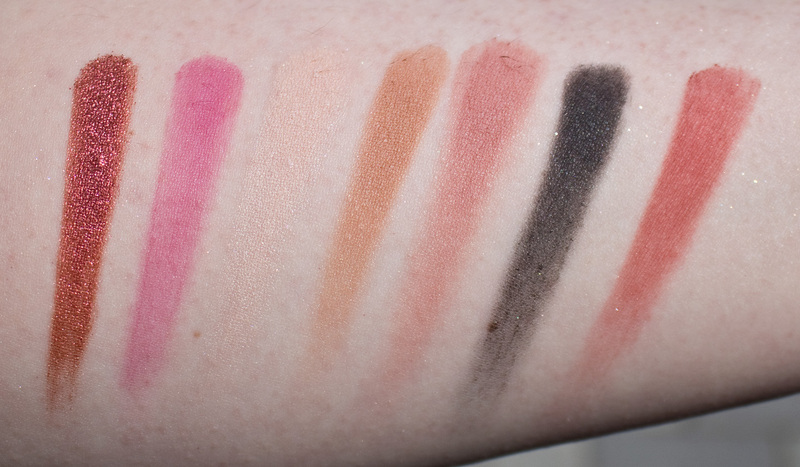 The mattes are more of pigment than shadows that makes it's necessary to use with a primer, but the palette is really good for drugstore and get my approval. Just Glow! Baked Highlighting Trio in 1334 Rooftop Rendevous makes me worried about the other 3 palette shades in this product line. They not as smooth and the baked Single shade and Trio shade single pan compact contour parts. They do work but only pick one you feel like you would use and I picked the one that felt like it could work on my pale skin it just lacked the punch of their other products. I have to say gives these a pass otherwise.